Facebook+ Lite is available under the “Social” section of Windows 8 app store. 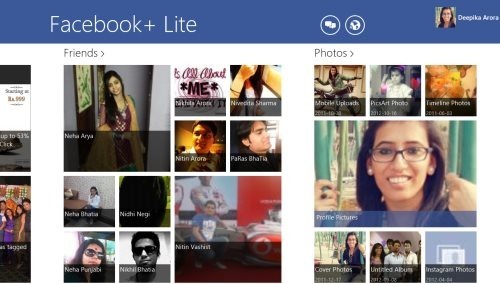 Facebook+ Lite is a free Windows 8 Facebook app that lets you browse and manage your Facebook account with ease on Windows 8. No official Facebook app is available on Windows 8 app store, so you can use this awesome Facebook+ Lite Windows 8 app to access Facebook on Windows 8. View all your feeds, albums, friend list, messages, notifications, and much more. Best of all, this Facebook Windows 8 app is absolutely free which make your Facebook browsing a wonderful one on Windows 8. Now, I cannot claim that the whole app works well as there are some features which I did not like. But, before proceeding, I would like to tell one of the interesting part of this Windows 8 Facebook app. All the photos from the photo album are displayed bigger in size more than the size which you have been viewing in your web browser. You can say that this Windows 8 Facebook app is a nice app to view photo albums on Facebook. So cool! Another part which i liked about this Windows 8 Facebook app is its user interface. The user interface of the app looks cool with all the feeds, albums, friend list all together on your computer screen. No ads makes the interface even better. Now let me tell you the part which I did not like about this Windows 8 Facebook app. As I already told you that the app facilitates you with the messages and notifications from Facebook to view. But, actually when I tested the app, I found that it is not allowing me to read the messages and view the notifications on Windows 8. It was diverting me to my default web browser displaying the Facebook login page. Browse and manage your social network with ease on Windows 8. Comment and like a photo by your friends. Share the photo from the share button in the charms bar. Update a new status with ease. Upload new photos from your existing or new photo album. Manually refresh the feeds with separate refresh button. The app works really fast. Also, check out our posts on Birthday Reminder Apps, Social Networking Apps, and Chat Apps. Proceed with further installing instructions. I truly liked the Facebook+ Lite app on my Windows 8 desktop. I love the fact that it displays the Facebook photos in a bit bigger size as compared to any web browser. Also, I like the browsing speed of this Windows 8 Facebook app. If you are looking for a simple and beautiful Facebook app, then install Facebook+ Lite app on your Windows 8 desktop. Make your social network browsing easier and faster.